International Health Challenge Push-Up Day is Saturday May 16th! 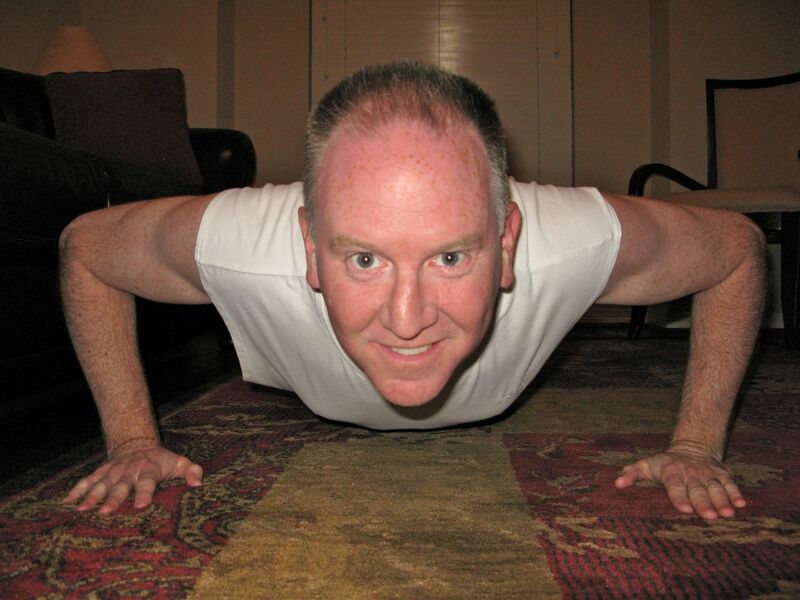 Home / Health & Fitness / International Health Challenge Push-Up Day is Saturday May 16th! April 26, 2009 By John P.
Everyone will have 24 hours to do, and keep track of, as many push-ups as they can muster in one day! Someone is going to do the most! Hmmm… can anyone out there challenge me? I think not! We’re all going to be really sore on Sunday May 17th! So, here in Dallas, not only am I going to do push-ups all day long, but I’m going to organize some sort of a Tweetup event for all the Health Challenge folks to get together! Maybe a local park? Hotdogs, hamburgers and pushups? Whose with me on this? Oh, and of course if you can’t join us in Dallas, that doesn’t mean you can’t organize your own local event! Just spread the word and lets get people around the globe participating all together! Just imagine how cool it will be if we have a hundred, or a thousand people giving their updates all day long on Twitter! I swear, that… would… ROCK! Now, let’s talk about preparation for a marathon day of push-ups so that everyone can do as many as humanly possible. That’s right, I said everyone! Even the ladies, and those of you who don’t think you can even do a single pushup! Read on cause I’ve got something for you! First of all, let’s define what a proper push-up looks like so there is no cheating! We’re going by US Marine Corps standards (because we don’t aim low!). A pushup begins in the prone position with feet together and hands placed on the ground shoulder-width apart. The next step is to bend your arms until your elbows are at a 90 degree angle while keeping your body rigid and straight. The finish comes when you straighten your arms and bring your elbows back to a locked straight position. So, you can only count a push-up where your elbows first went to 90 degrees (arms parallel with the floor) and then returned to a locked position. That equals 1 (one) push-up. 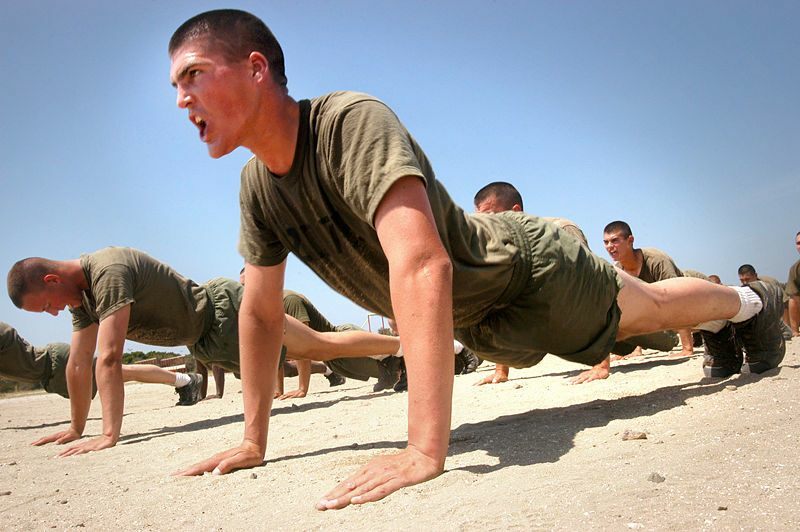 Before everyone starts complaining, if I were REALLY going to make you do a USMC style pushups, they would go like this! Now, push-ups are a very difficult exercise. In my case, I currently weigh 181 pounds. So I’m putting all of that weight on my back, arms and chest and lifting it repeatedly. Not everyone can do this, and women traditionally don’t do push-ups the same way as men, so there are two alternatives for those of you who have difficulty with this. Do the exact same push-ups but put your knees on the floor. This will relieve a lot of the pressure on the arms because of the angle. Give it a try. You can do the same push-ups but put your hands on a chair to increase the angle of attack, or a counter if you need a slightly greater angle. No exercises at all on Friday! Maybe even Thursday if you are really going to to at the record on Saturday. Drink a lot of water! Water will keep you hydrated and give you fuel to keep up your endurance. Eat small meals throughout the day Tuesday and Wednesday consisting of protein and carbohydrates. Now, let’s get it on! And for some extra motivation, here is a girl who can beat us all at push-ups… so, no whining is allowed! PS – Remember to spread the word. The more people do it, the more fun it will be for everyone! I can only do 23 in a row though. I got the e mail around midnight, although I have never done push ups I decide I have 24 hours to do it .So I just started. I have done 20 by midnight tomorrow I will do the rest. The have given me a great enthusiasm about physical activity which I never have.So maybe next could be the thriatlon.I only need how to bike. Hot Dogs, Hamburgers and Push Ups??? How about Hummus, Whole-Grain and Pushups! Tami, I’m perfectly happy with you starting with just one, because it means you are starting! :-) The most important first step! Okay, I’m going to start with one and go from there. I went to the hundred pushups site and am starting slow. Not sure what will happen on May16th, but we shall see. I remember the days when I could do them non-stop…it’s a totally different story now lol. The most I’ve ever done in a row is 35 but, for that day, I am setting a goal of 150 at least. Let’s start a bedding, who gives more? Maybe we can challenge eachother to raise our goals. Cool Idea!!! Heath is most important in our life. John, thanks for sharing!